Mersiha Mesihovic, hailed as the rising NYC choreographer by the theworlddances.com is a Bosnian/Swedish dance-artist & the founder/artistic director of CIRCUITDEBRIS. Mesihovic received her training at Balettakademien in Stockholm, Sweden, Sarajevo National Ballet School in Bosnia and Herzegovina, Iwanson International School for Contemporary Dance in Munich, Germany and holds a BFA in Dance & Choreography from California Institute of the Arts. She has had the honor of dancing in works by contemporary icons as Ohad Naharin, Colin Connor, Trisha Brown, Rami Beer, and has collaborated closely with such intrepid artists as Karen Bernard, Reggie Wilson & Jaamil Kosoko. In addition she has worked with composer/saxophonist James Brandon Lewis. Mesihovic was the resident artist at the Choreo Collision/Danza Venezia (2012), Atlantic Center for the Arts in New Smyrna Beach in Florida, (2015), Earth Dance in Massachusetts, (2016). Her work is has been presented internationally and received support from New Dance Alliance and New York Foundation for the Arts. Currently, Mesihovic resides in New York where she is actively developing her unique Movement Method EMBODIMENT and teaches at Universities, Dance Centers, and Dance Companies in US and abroad, including Witwatersrand University in Johannesburg & Tshwane University of Technology in South Africa, Kun-Yang Lin/Dancers in Philadelphia, Gibney Dance: Agnes Varis Performing Arts Center in New York. Mesihovic was born in Mostar, a city situated on the emerald-green river Neretva and known as the cultural capital of Bosnia & Herzegovina. When war broke out in 1993, her family was forced out of their home and found themselves on the last bus out of the city of Mostar to Sweden. Mesihovic did not begin her formal dance training until age of 18, to suffer a serious dance injury and find herself on a verge of mental collapse at age of 20. She returned to dance at age of 22 attending Sarajevo's National School of Ballet in 2000, Balletakademien in Sweden in 2004, Iwanson Contemporary School of Dance in Munich, Germany in 2005 and graduated with a BFA in dance from California Institute of Arts in 2012. Upon graduation Mesihovic was invited to participate in the residency CORPO A CORPO during the 8th International Dance Festival in Venice, Italy under direction of Wienna Tanz Festival director Ivo Ismael and London based choreographer Shobana Yeyasingh as as one of 10 emerging choreographers worldwide. While in Europe Mesihovic studied with London based choreographers Hofesh Shechter and Jasmine Vardimon whose influence was instrumental in approaching her own movement voice. in the end of 2012 she decided to base her self in NYC along her long time collaborator saxophonist/composer James Brandon Lewis where CircuitDebris was established in early 2013. Yuki Fukui originally from Tokyo Japan, is a NYC based dancer, choreographer and teacher. Fukui started dancing at age 3 and received her training from Yoko Shimizu in Amsterdam (The Netherlands), Misao Kai in Tokyo (Japan) and Sara Magistro in Paris (France) as a young dancer. In 2006 she moved to NYC to attend Eugene Lang College The New School for Liberal Arts. While her time there she had the privilege of performing works by Takehiro Ueyama, Karla Wolfangle, Rebecca Stenn, Jose Limon(staged by Sarah Stackhouse), Anna Sokolow (staged by Jim May), Jill Johnson, to name a few. Since graduation in 2010 with a B.A in the Arts concentration in Dance, Fukui has performed with HIU-Shudan, DajhiaIngram Dance, The Movement Collective, Amalgamate Dance Company GAS Series and Dirty Soles Dance. Currently, Fukui is an artist represented by Bellus Productions LLC. In addition to being a member of Mersiha Mesihovic/CircuitDebris, Fukui dances for Gwen Rakotovao Company where she serves as the Associate Artistic Director, as well as, as the Associate Director for the Company and Dance Academy of Long Island Dance Project. Originally from Montreal, Ariane Bernier earned a BFA in dance from l'Universite du Quebec a Montreal. Here in NYC she has worked with Heidi Dance, Holly Heidt, Kendra Portier, Sarah Rosner and others. She has performed at HERE Arts Center, Dance New Amsterdam, la Roulette, Triskelion Arts and the Judson Church, to name a few. 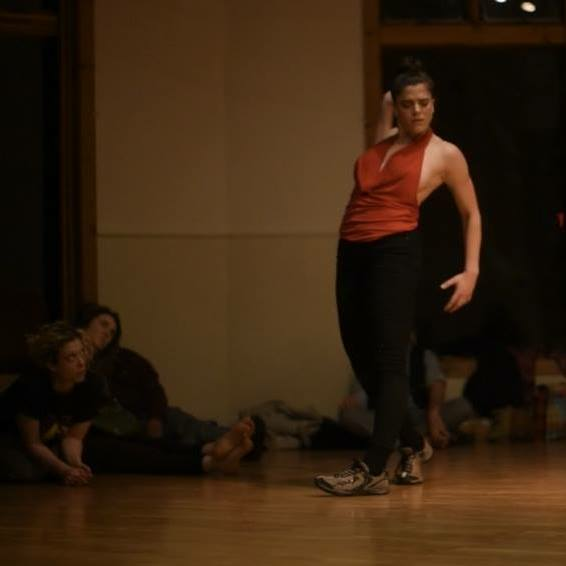 She presented her work at Chen Dance Center as part of the Newsteps choreographer's series and at LPAC with Mare Nostrum Elements Emerging Choreographer Series last December. She’s currently working with Marcos Duran Performance Group, Laura Neese, The Red Gloves Performance Group and is thrilled to be a part of Mersiha Mersihovic/CircuiDebris company. Ariane is a certified Simonson technique teacher and a Vinyasa yoga instructor.